**** on the collar bone. The trophy is more important! "Just 15 days after breaking his left collarbone at Assen, Jorge Lorenzo has suffered another heavy accident at the Sachsenring. Damage to the titanium plate in the champion’s left shoulder means a further operation could be required." Not good for Hip Hip Jorge recently. 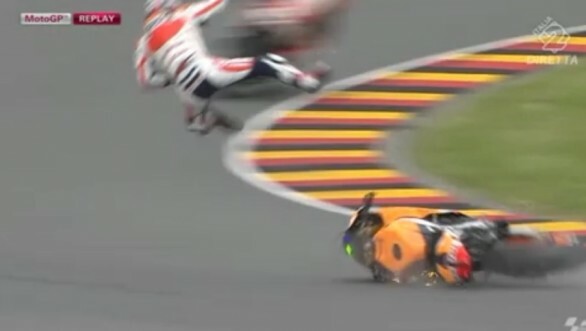 IDK - MotoGP, IMHO, isn't good. Only a few top moto's are in contention. Though the last couple of races have been good, the fact its a two tiered series is just Wrong. Either its the ultimate racing series or its not. Get it together. Well, it's not as bad as F1, which is a joke IMO. It is the top tier so I will watch. The stepping stone levels have existed as long as I've been on 2 wheels, so it's all I know. Josh Hayes is the AMA, at least every time I watch that. Everyone said Hondas would rule after Lorentoes last crash and a Vale won. And just like last time, the reports are George is out for the race... We'll see. Wow! Apparently bent the plate! And Dani took a ride in the chopper! Quick Reply: Jorge has another big high side!